Digital Design of Signal Processing Systems discusses a spectrum of architectures and methods for effective implementation of algorithms in hardware (HW). Encompassing all facets of the subject this book includes conversion of algorithms from floating-point to fixed-point format, parallel architectures for basic computational blocks, Verilog Hardware Description Language (HDL), SystemVerilog and coding guidelines for synthesis. 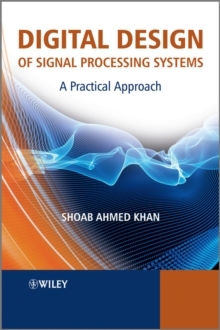 The book also covers system level design of Multi Processor System on Chip (MPSoC); a consideration of different design methodologies including Network on Chip (NoC) and Kahn Process Network (KPN) based connectivity among processing elements. A special emphasis is placed on implementing streaming applications like a digital communication system in HW. Several novel architectures for implementing commonly used algorithms in signal processing are also revealed. With a comprehensive coverage of topics the book provides an appropriate mix of examples to illustrate the design methodology. Key Features: * A practical guide to designing efficient digital systems, covering the complete spectrum of digital design from a digital signal processing perspective * Provides a full account of HW building blocks and their architectures, while also elaborating effective use of embedded computational resources such as multipliers, adders and memories in FPGAs * Covers a system level architecture using NoC and KPN for streaming applications, giving examples of structuring MATLAB code and its easy mapping in HW for these applications * Explains state machine based and Micro-Program architectures with comprehensive case studies for mapping complex applications The techniques and examples discussed in this book are used in the award winning products from the Center for Advanced Research in Engineering (CARE). Software Defined Radio, 10 Gigabit VoIP monitoring system and Digital Surveillance equipment has respectively won APICTA (Asia Pacific Information and Communication Alliance) awards in 2010 for their unique and effective designs.